Today at lunch, the Makalu design team had a fierce debate with the Makalu development team over the relative merits (or lack thereof) and likely futures of the iPhone vs the Android. I won’t go into the details of the debate, as the following photo pretty much sums things up. 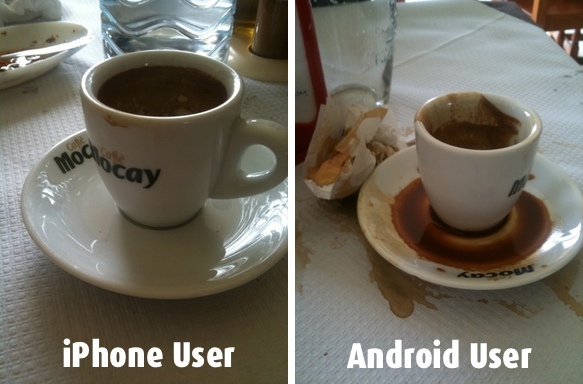 I have one of each, and the Android is winning out. However, this is mostly because of AT&T. If Verizon had the iPhone, I would probably choose the iPhone. A phone is only as good as its carrier, and AT&T drops nearly 50% of my calls. After owning both I love the iPhone but the Android comes out of top, more of a phone. Previous Previous post: User interface review of the new and improved Securitas Alarm.